The Friends of the Historic Great Falls Tavern is a not-for-profit, member-supported organization dedicated to preserving the Historic Great Falls Tavern and other historic structures located in the C&O Canal National Historical Park. Originally founded in 1973 as the Friends of the Great Falls Tavern to advocate on behalf of preservation and educational projects in the park, The Friends of the Historic Great Falls Tavern was recognized as a qualified 501(c)(3) charity in 1997, both to carry on the mission of the the original Friends, as well as to enable the organization to accept active stewardship of major preservation projects in the Park. Your membership in the Friends and your donations to its activities make it possible to maintain these activities. Please visit our Membership and Donations page. If you've visited the canal near the Great Falls Tavern Visitors Center lately, you may be wondering what is going on! Why is it all dug up and why is there a big pipe where the canal should be? A $6.7 million construction project is underway to improve locks, waste weirs, bridges and water control structures between locks 5 and 22. The changes will help the canal deal with floods and will ease maintenance burdens. The work will continue through 2019. Unfortunately, the affected area of the canal has to be drained during the work. 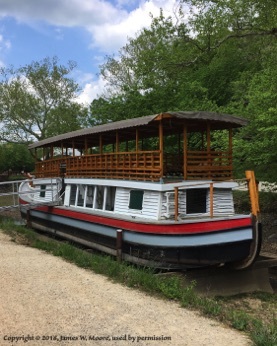 That means that the Friend's Charles F. Mercer replica packet boat will remain high and dry, not operating in 2018.